I’ll ride it like the engineers designed it, and explore the borderline conditions that “hopefully” they, too, had anticipated. Finally, I like to explore the culture and people around my rides. Motorcycling and Scootering are extremely social, more so than car clubs and almost any other daily activity, and it’s extremely important to understand the culture that you’re joining or signing up for when you mount your ride. In this case, I’ve been exploring the culture of the BV250 Tourer. “I grew up in a time an place were by age 14 up untill 18 PIAGGIO meant freedom. It was in the shape of a moped, a 50cc Vespa if you were lucky or even an APRILIA race replica for the upper class. Vespa were extremely easy and cheap to hot rod, we could make them go 70mph (stopping was a different issue) and we would fix the fuel (oil + gas) at home. Then the scooters came along even better: 4 stroke, fuel injection, great suspensions, tubeless tires, great brakes. Low center of gravity extremely quick and nimble a lot of fun to ride “hard” with very little effort. Scooters are not to be compared to Ducatis They simply serve a different purpose and they do it damn well. Ducatis are not meant to go grocery shopping, they are a pain in the a*s for that. But scooters can make it fun. I hate driving the car and by the time I dress up warm up the ST4, push it off the stand back it up in the drive way and do trial-grade stunts between cars for a 10 minute ride, I’d rather walk to the store. That pretty much sums it up for me. You don’t take a station wagon to Track Days, and you don’t pack your kids in the Ferrari to drop them at school and then pick up the groceries. The respect is in the ability to do the particular job as the engineers intended and enjoy the experience. People don’t ride anymore because it’s the only transportation they can afford. If you’re riding, you really want to! “Scooter Culture”, as viewed through the eyes of the members of the larger Southern California Clubs, represent an evolution from the days of the Mods, or “Moderns”, that used often highly customized scooters and very natty clothing choices to identify themselves in the Britain of the early-mid-1960’s. Britain has always had an almost “uniform” quality to the groups and social castes that one belonged to, and the Mods were no different, their transportation choice being a significant accessory. The Mods had evolved and disappeared as a force well before the 1970’s — Quadrophenia was a significant historical “rockumentary” that celebrated something that was gone for more than a decade before the movie was released. But the movement never really died — it evolved, and Quadorphenia actually helped revive it in the US. My friends in college (’79-83) rode Lambrettas and listened to The Police, English Beat, Untouchables and the like. Scooter clubs today revolve around the old Vespas and Lambrettas, some more than 50 years old and ridden daily. They know every period accessory available. They quote production numbers for the rare ones. They ride in cold weather with their big parkas. They listen to soul music. They don’t particularly like the new scooters. I was at a large Italian/French Car/Bike show this weekend where many vintage scooters showed up. Some just dismissed the new stuff and declared that Vespa and Piaggio should make their old metal models with new engines and continue with gearboxes. Others said that new scooters looked too much like hot rod sport bikes and the old look was gone. I showed them pictures of the new Piaggio BV250 Tourer. Every one of them loved the new look, some even exclamatory. I don’t think they dropped what they were doing and ran down to the local Vespa/Piaggio dealer, but that’s not the point. They opened up. They started to talk to me about how people on newer scooters would come to their rallies and events and “not understand” why everyone was dressed up or playing lots of reggae or motown. They just thought that having a scooter and riding around was the whole thing. It’s only a part. The Piaggio will not get you a membership into any “rude boy” group of scooterists automatically — it’s up for you to display the “heart” needed. But the Piaggio BV250 Tourer gives you the opportunity to love what you ride, keep up with the pack effectively, and explore “just why YOU ride”. The culture you’re interested in might just be limited to you and your wife riding along the ocean or to a breakfast on Sunday morning. It might involve buddies for coffee, only half of them ever on two wheels. It’s actually not important if you don’t need it to be. Riding anywhere in an urban environment on a scooter allows you to go efficiently and without malice. You get “license” to park just about anywhere as long as people don’t trip over you, and you can jet through the narrowest of spaces and lanes as long as you’re not aggressive. The BV has enlightened me to the benefits of owning a scooter — the quick, easy and efficient dash to pick up groceries, the “hey I’m just going over for coffee” transport, and the “let’s ride down to the beach and cruise” weekender. For guys, they’re a “conversation starter”. A big-bore bike has much more “weight” than a scooter. Scooters are non-threatening, yet, somehow, you just want to talk about them — “hey, I always wanted one of those”…. Better than puppies for meeting girls. For women that I’ve spoken with, they are a differentiator. They are a statement of confidence and independence. They are NEVER getting on the back of their own bike, and you’re probably not going to get a ride unless you are really trustworthy. 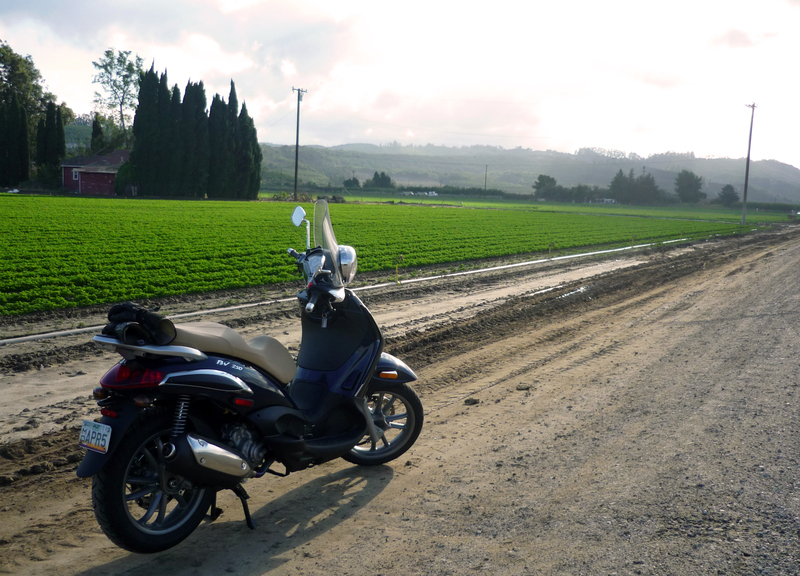 I’m over 800 miles in 12 days on the Piaggio BV250. I’ve had a blast. Never met anyone that didn’t like it. Never met an aficionado of scooters that wasn’t surprised by the looks and equipment. People that don’t ride have considered one. People that ride motorcycles are sometimes changed to potential scooterists. I wave to everyone on two wheels. This entry was posted in bike reviews, scooter reviews, scooters and tagged buying a scooter, BV250, BV250 Tourer, commuting scooter, freeway scooter, Italian Scooters, Maxi Scooter, modern scooter, mods, new scooter, Piaggio, Piaggio Reviews, Piaggio Scooter, rude boy, scooter culture, Scooter review, Vespa alternative. Bookmark the permalink.